"Mermaid Hair by Katie Rogers"
An awesome new form of micro bead hair extensions invented by a young entrepreneur from Dallas named Katie Rogers. Katie coined the hashtag #ThickestHairInTheSea when she was starting out her journey for the best hair extensions, and eventually went on to create not only a high quality line of extensions, but a fun, whimsical lifestyle based around Mermaids - the goddesses of the ocean. The Mermaid micro bead technique, also known as "I Tip," uses a non-slip micro bead to attach a tip extension to the existing hair. The tip looks a lot like a thin shoelace. The extensions are attached using a bead and loop tool No heat, glue, or chemicals! Beaded extensions are semi-permanent and last an average of 6 months (and up!) depending on at home daily care. Maintenance appointments are required every 5-6 weeks. 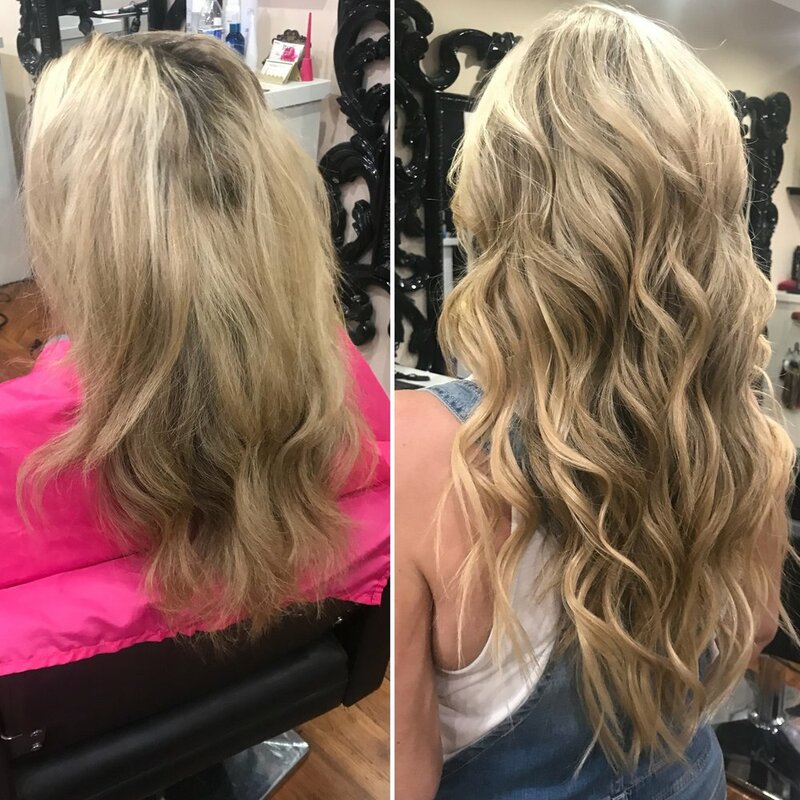 Each set of extensions is handmade by a Mermaid at Katie Roger's headquarters, and they are twice as thick as other hair companies on the market. Your Mermaid Maker (your personal stylist) will color match you and send your customized color order in to be made and shipped. The colors chosen are then fully blended together and tipped just for you, and shipped out; they take about two weeks all together to arrive. What is so special about this specific brand? They are twice as thick as other micro bead extensions on the market and the colors are completely customizable for the perfect blend. Micro beads don't require any heat or glue and are the least damaging form of extensions. Here is a comparison of other brands we like to call "ursula hair." Why are they called the Thickest Hair in the Sea? Average micro bead extensions come as 1 gram of hair, and Mermaid Hair pieces are each 2 grams of hair. Strength in numbers! You know the test where you take one stick and try to break it in half, then take a bundle of sticks and try to break them in half, it is much harder, right? So if each extension piece has more hair, then more of your own hair goes into the bead, preventing breakage of your natural locks.